Each week, culture intern Katherine will scour great works of literature for all the cheesy details your English teacher never showed you. Authors often include mentions of food and drink in their written works to give the reader a small glimpse into the culture and historic foodways of a particular place and era. This blog series will lend readers a helping hand and shed some light on the cheeses between the lines of the literary greats. Also, each week you’ll have a chance to win a special issue of culture magazine. The Odyssey: An epic poem of over 12,000 lines of dactylic hexameter, written in several different Greek dialects, and was originally shared in the oral tradition of long ballad rather than being read (are you listening here, English teachers of America?!). We owe quite a bit to Homer and his never-ending Odyssey. The words “siren” and “odyssey” are directly derived from the ancient text and phrases like “between a rock and a hard place” stem from the characters’ encounters with difficult obstacles (in this case a deadly multi-headed sea serpent named Scylla and a swirling vortex of watery doom known as Charybdis). And, perhaps most importantly, the Odyssey gave us Feta cheese. 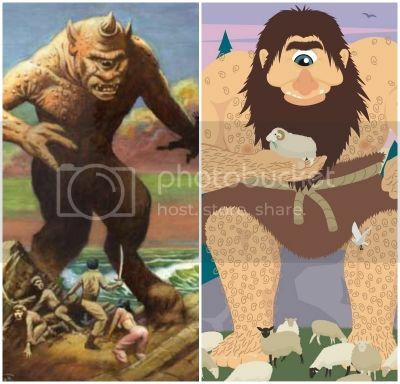 Both history and Odysseus have sold poor Polyphemos short, making him out to be monster rather than the humble cheesemaker he really was. Taking care of several flocks of sheep of varying maturities ensures that milk is readily available and always fresh. As the poem states, Polyphemos has a separate area reserved for his dairying—earning him points for a sterile work environment—and has all the necessary equipment including the special vessels that give Feta its shape. Traditionally, Feta is a soft, white, compact cheese that is aged in brine and has no skin or rind. It is usually formed in large blocks that can then be cut into smaller blocks, cubes, slices, or crumbles. Its maximum moisture content its 56% which makes it a sturdy cheese meant for crumbling and topping dishes rather than melting or mixing. To put that into perspective, an aged Parmesan has approximately 30% moisture content and a very soft brie can be anywhere between 60 and 75%. However, soft varieties of feta (rarer finds in some markets) are spreadable and used to make cheese pies and other creamy dishes. After setting, feta is typically stored in a brine made from its own whey. 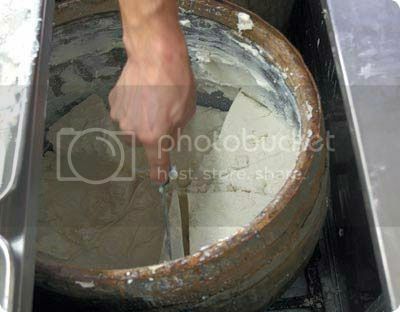 When Odysseus remarked on the amount of whey left in the dairying containers throughout the cave, both he and Greek readers knew that meant there was an equal amount of cheese somewhere nearby. To curdle the milk, Polyphemos would have heated the milk over a fire and set it aside in the wicker strainers to form a thick curd. While the poem does not mention it (or maybe Odysseus does not care for the finer details of cheesemaking), both rennet and some sort of acidic starter would need to be added to transform the sheep’s milk into the early stages of fresh Feta cheese. 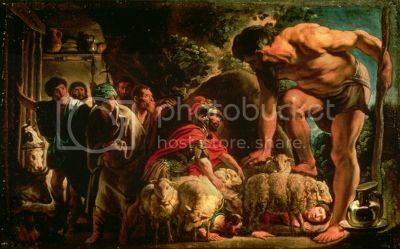 After the giant is satisfied with his cheesemaking and finished with his supper, Odysseus and his men attack the gentle shepherd, blinding him in his one and only eye. Polyphemos, enraged by his loss of sight and the presence of thieves in his cheese cave, fights back only to have Odysseus and his men escape by riding away on his own sheep. Wanting revenge, Polyphemos summons his father, who just so happens to be Poseidon, and begs him to punish his abusers. The god of the sea obliges his bullied son, cursing Odysseus and his men to wander the seas for an entire decade (and high school students forever more). Is it any coincidence that Poseidon, god of the salty seas, is related to the creation of Feta, a cheese of the saltiest variety? I think not! While Homer isn’t necessarily credited with inventing the salty, crumbly Greek ambrosia, he certainly devoted enough lines of his epic poem to the discovery, making, aging, and consumption of the cheese. To thank him, we should sacrifice some string cheese in his honor; or, maybe we can all enjoy a nice Greek salad with some crumbled Feta while rereading the Odyssey instead. 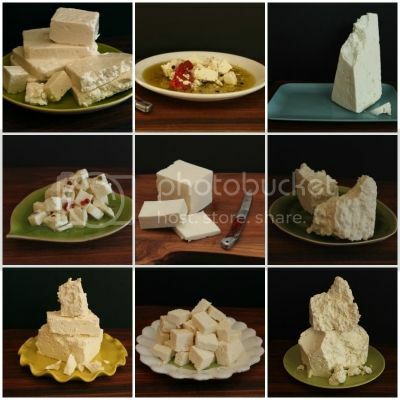 Photo Credit: Featured image of feta on spoon from Shutterstock. Katherine was a social media intern for culture and a fan of all things Southern. Born and raised in Texas, Katherine recently moved up north to pursue a graduate degree in the Gastronomy Program at Boston University. When she's not researching for her Master's thesis or dreaming about jalapeno cheese poppers, Katherine writes on her own blog The Young Austinian ( http://www.youngaustinian.com/ ).